Railpictures.ca - Bruce Mercer Photo: In the period 1982-1984 CP again went to B&O ( by now, officially Chessie System) for leased power. A westbound at Belle River, Ontario shows clean 5746 with the white frame stripe leading B&O GP38’s 4800-4816 past the service equipment on Mar 22/84. In a couple of years those GP38′s would become the domestic power on CSX lines within Ontario, so instead of watching them go by, I’d be operating them. | Railpictures.ca – Canadian Railway Photography – photographie ferroviaire Canadienne. Copyright Notice: This image ©Bruce Mercer all rights reserved. Caption: In the period 1982-1984 CP again went to B&O ( by now, officially Chessie System) for leased power. 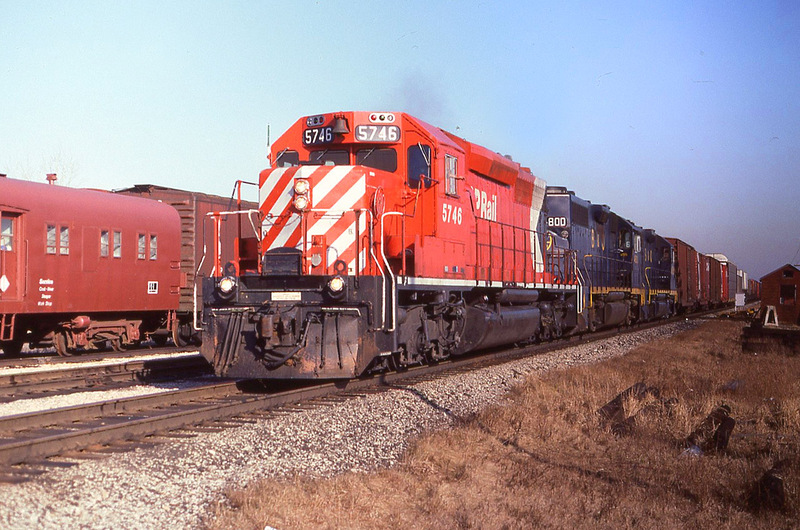 A westbound at Belle River, Ontario shows clean 5746 with the white frame stripe leading B&O GP38’s 4800-4816 past the service equipment on Mar 22/84. In a couple of years those GP38's would become the domestic power on CSX lines within Ontario, so instead of watching them go by, I'd be operating them. Good question, that’s quite a few years ago and I don’t necessarily recall a station back in those days ( or conversely, knowing where it once was). Maybe Geoff Elliott or Earl (The Pearl) Minnis have a shot of it, on here. Great photo Bruce. I have yet to make it to Belle River…the maintenance shed to the right…would this be sitting on what used to be the station grounds, or foundation?